Can forklift certification in NC help you land your dream job? As a matter of fact, you are required to have a forklift license in NC to drive a lift truck. And also, it’s the law. By law, it is the employer’s responsibility to ensure that their employees have the necessary training and meet the legal requirements before they can drive a fork lift truck. Driving fork lift without a valid OSHA license, or driving with a suspended or revoked license, is illegal and your employer could be fined upwards of $7000 for the violation. So good luck finding a job without having a valid fork lift operator license. If you are seriously considering to become an operator, then you should get the proper forklift training and get your certification today. If you already have a valid operator license, then North Carolina is a great place to start your career as a fork lift driver. Because there are so many job opportunities available for an operator in factories, warehouses, and storage facilities all around the state. And in this article, I will talk about the legal requirements you must meet and job opportunities that forklift drivers in NC have. And if you wish to become a lift truck driver and get your OSHA forklift certification in North Carolina, how to go about doing so. And what is the exact process of gaining your forklift license? I will also cover the expected salary for a fork truck operator in all the main cities in the state of North Carolina, and additionally, I will list some of the best forklift training schools in NC to get you started with the process. So let’s get to it then. Most of the requirements for being eligible to learn to drive a forklift in NC are the same as in any other state in the United States. However, there is one particular rule that has been created by the North Carolina state government, not OSHA. What is that rule? We’ll come to that at the end of this section! The first OSHA regulation is that nobody under the age of 18 is allowed to operate a lift truck. The fact of the matter is that children (by which I mean anyone under the age of 18) are not mature enough to operate a piece of machinery which could easily take a life. Did you know, most of the fork lift accidents that occur across the whole country are caused by people who are under the age of 18 and therefore shouldn’t have been driving it in the first place? Secondly, you must not have a criminal record of any sort. If you can’t be trusted to obey the law, how on Earth can anyone expect you to be trusted to operate a lifttruck? Thirdly, you cannot be on any sort of medication which has any chance of altering your mental state. I respect that for thousands of Americans, medication is required for survival, however, having a mentally unstable person operating a fork lift can have disastrous consequences. You also cannot have a past of alcohol, drug, or substance abuse for the same reason. In the state of North Carolina (and South Carolina too), the state government has made it law that anybody who wishes to get a forklift license must make sure they have a drivers license beforehand. If you do not have a drivers license, you may not attempt to get a operator license. What is the job description for a forklift operator? Read here. The process of getting your hands on a forklift operator license is the same as in every other state. Don’t know what that process is? Well then read on! If you’re lucky, you may get employed by somebody who is willing to give you the legally required training. In such circumstances, there are 3 options. Firstly, the company may have a permanent in house trainer. Secondly, they may hire a trainer for you. Thirdly, they may send you off to a training school. The training school is the best option for anybody who is not currently employed. 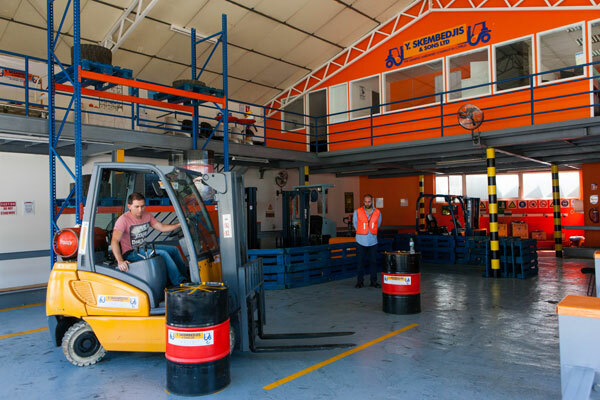 If you choose to attend a training school, then you must obey the following steps to be able to become the proud owner of a fork lift certification. Find an appropriate training school near you. 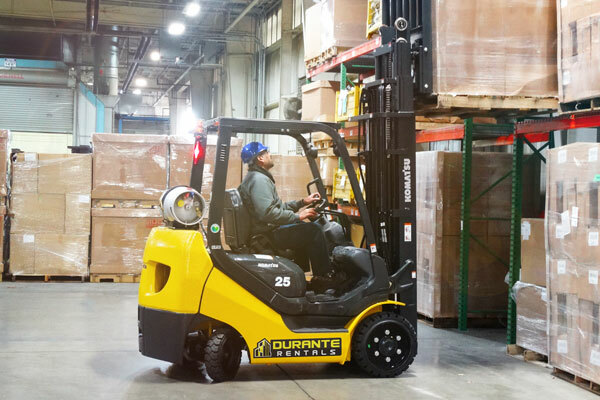 Make sure that it’s within your budget, within a distance that you can reach, and that they do training for the type of fork lift that you wish to operate – yes, there are different types of the lifttruck. Enroll in the school, this can usually be done online. Listen to a four hour lecture about fork lift operating. I know it’s dull, but it’s necessary. 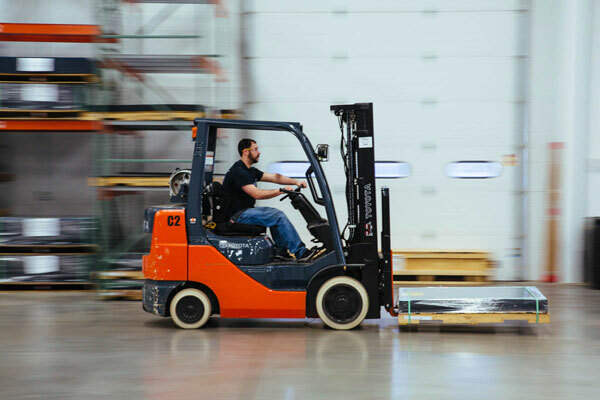 During this lecture, you’ll learn about the basic controls, fundamentals of driving a lift truck, OSHA regulations, safety procedures, accident reporting, and many other pieces of knowledge that are vital to operating a forklift safely. Take a written exam made up of 15-20 questions. In order to pass, you must correctly answer 75% of the questions. Although in some schools, the pass rate is even higher! Once you’ve passed the written test (forklift training test), you must pass a practical test in which you have to complete a series of tasks to your assessor’s satisfaction. These tests may include breaking on time, navigating in tight spaces, and safely moving a heavy load from one place to another. 6. If you have completed the practical examination… Congratulations! You now have your fork lift operator license and are legally eligible to drive a lifttruck! If you want to become a certified forklift trainer, read our train the trainer guide. To obtain your forklift license in North Carolina, you will need to enroll in one of OSHA forklift training classes and complete your training. Here is a list of schools for forklift training in NC state where you can get your on-site forklift certification. OSHA Forklift certification locations in North Carolina in the alphabetical order. 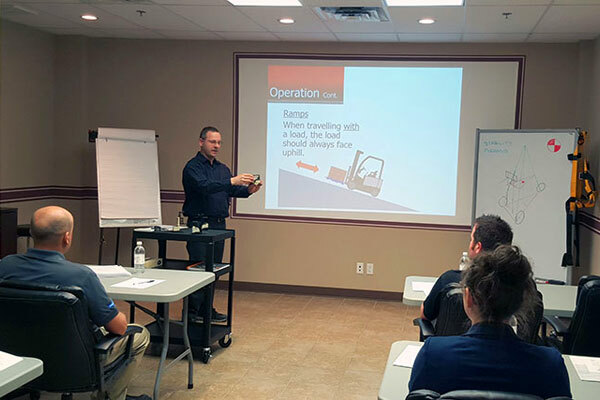 The list of forklift certification classes and schools was last updated on April 1, 2019. If there are any inaccuracies, please report it to us. As mentioned in the introduction, North Carolina is one of the best places to become a fork lift operator. There are lots of growing industries here and warehouses all over the state. But especially I would like to point out the state capital ‘Raleigh‘ which has got the most employment opportunities as well as the competitive salary for people in the industry. The county and state government. As a political body, they have lots of different jobs for lots of different skill sets. As unlikely as it may seem for a company like that to need fork lift operators, it’s public money which funds a lot of roads, buildings, and parks- all of which require lifttrucks. Wake Public School System. Most schools have many heavy objects which require a lift truck to be able to move. The same applies to universities; NC State University is also a big employer of forklift operators. The energy giant ‘Progress Energy’ which is based in Raleigh requires forklift drivers to be able to move barrels of oil, imagine if they had to move them by hand! Raleigh is also home 2 hospitals- Duke and Rex. Anyone who’s been to a hospital could tell you how much heavy equipment they use. (Here’s a hint- it’s a lot). Finally, airports. With 7 public and 10 private airports, Raleigh has no shortage of places to fly. Although in general, the salary of a lift truck operator in NC is slightly lower than a lift truck operator in New York or New Jersey but the quality of life in NC is much higher than in New York City! The quality of life is measured by the Quality of Life Index which awards each city with a number of points to determine how good the average person has it in that city. The following data comes from ‘numbeo.com‘. The QLI in Raleigh is 225. In New York City it’s 120.8. So although New Yorker Fork-lifters get paid a lot more, their quality of life is not as good as those in Raleigh, NC. There are benefits of having a forklift license regardless as to where you live. Any company is far more likely to employ somebody with a operator license on hand than somebody who they’ll have to provide training to. Training new employees on how to safely handle a fork lift takes time- time which could be used making money. Being able to put ‘fully certified to drive a forklift truck’ on your resume will tell your employer that you have taken the initiative to get the training yourself, you’re skilled and therefore productive, and most importantly, you can get straight to making your boss money. The minimum wage in North Carolina is $7.25. 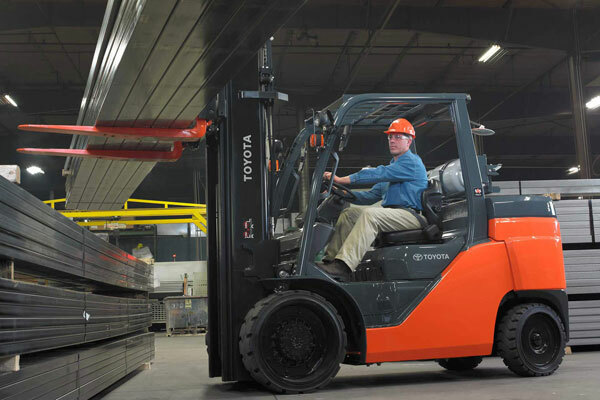 The average fork lift operator will earn about $15 per hour. In terms of salary, NC is probably not the best state in which to become a lift truck operator, but it is not worst either. In fact, the hourly wages are more comparable to the national average. Despite all North Carolinians getting a salary of at least $33,060 per year, there are some cities in which you could make even more than that. Forklift drivers in Cary, it’s $33,487. In Charlotte, it’s $34,184. In Hickory, it’s $33,766. In Gastonia, it’s $34,080. And in Winston Salem, it’s $33,417. So let’s look at how much does a Fork Lift Operator make in North Carolina state. The table below shows forklift operator’s annual base salary for 21 major cities in the NC region. * Forklift operator salaries were last updated on April 1, 2019. Now: Did you know, a fork lift operator in Washington gets paid at $16.50/hour on average? Well, they do and if you are looking to get forklift certification in Washington, then you must check our guide to see how to get your forklift operator license. I’m afraid it’s that time of the article again when we have to talk about OSHA regulations. There are unfortunately some circumstances in which you will be required to renew your license, and yes, this means having to do the training all over again. Anyone caught using a fork lift in a dangerous manner will have their license revoked! A ‘dangerous manner‘ means acting in a way which could harm yourself or others. In some certain circumstances, this may even come as a consequence of causing an injury or having a near-miss. Anybody who fails an OSHA inspection for whatever reason will have to renew their operator license. By law, OSHA is allowed to carry out a surprise inspection on any company it wishes whenever it wishes. Earlier, I mentioned that there are different types of lifttrucks and before you apply to a training school, you have to be sure that they do the type of lift truck that you wish to use. Naturally, this means that if you’re going to operate a different type of fork lift, you’ll need to be trained on how to use it. Finally, a OSHA forklift license renewal is set for every 3 years. This is very annoying but 3 years is plenty of time to forget vital information. Once your OSHA license expires, it must be renewed! 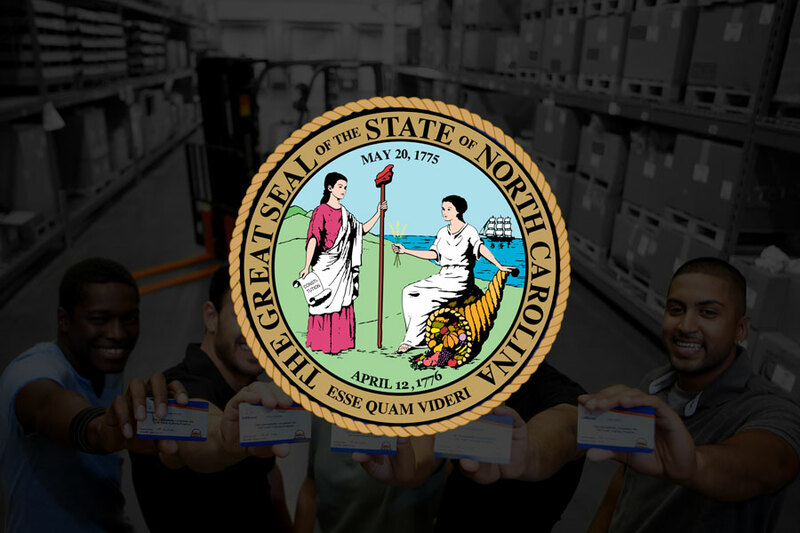 If you still have any question or need more information about forklift license in North Carolina state, then you can get in touch with the North Carolina Department of Labor or an OSHA Area Office in North Carolina. The process of becoming a forklift operator and the laws surrounding it are very similar in North Carolina to every other state in the United States of America. The only fork lift law created by the state government and not OSHA is the law about having to have a drivers license before you can get a forklift license. Once you get your forklift certification in NC, you can brush up your forklift operator resume and begin your hunt for the job. North Carolina has so many exciting employment opportunities for a lift truck driver and chances for growth are very bright as you can become a trainer or get promoted to a warehouse manager. In North Carolina, you may not earn as high as New York, but the cost of living and health care are much lower than other states. In fact, the quality of life in North Carolina is much higher than most of the states in the nation. So what are you waiting for? Go get your forklift certification today! Although I laid out everything that you need to know about getting your forklift license in NC, but if you still have any questions, you can ask them in the comments, or you can also email me. Applying for forklift license in Pennsylvania, check our PA guide! Copyright © Forklift Labs. All rights reserved.